Mexico police fire on US staff Jump to media player Two people employed at the US embassy in Mexico have been wounded after their car was mistakenly fired on by police south of Mexico City. The Mexicans who feed immigrants Jump to media player A group of 14 Mexican women are handing out food and water to weary Central American immigrants who pass by their village as they travel on trains to the US border. Mexican wrestlers combat obesity Jump to media player Health officials in Mexico are using the country's famous 'lucha libre' wrestlers to promote a new campaign encouraging regular exercise and healthy eating among the nations' obese. Mexicans celebrate football gold Jump to media player Mexico's men won the nation's first Olympic football gold medal, beating Brazil in the final. 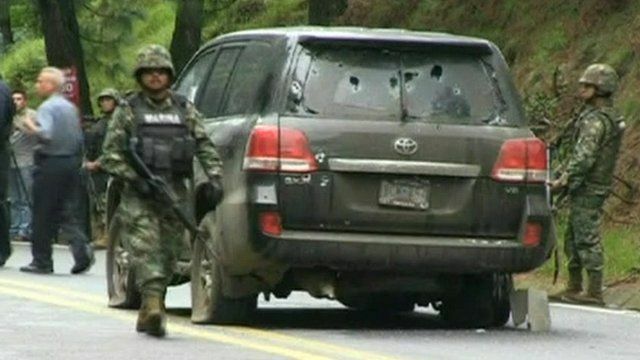 Two people employed at the US embassy in Mexico have been wounded after their car was mistakenly fired on by police south of Mexico City. The Mexican Navy said the US personnel were on a main road to the city of Cuernavaca when the shooting happened. Details are still unclear, but the navy said the US vehicle had been fleeing from gunmen in another car. 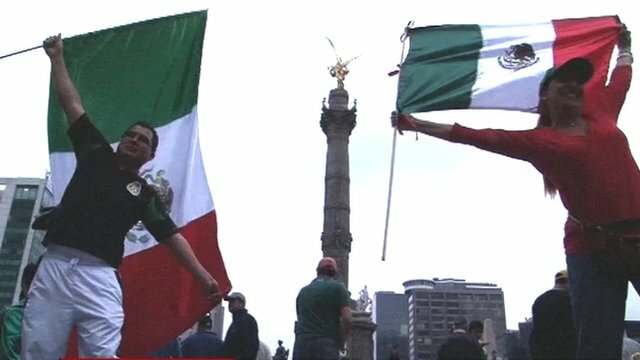 The US state department said it was working with Mexican authorities to investigate the incident. Spokeswoman Victoria Nuland said the two men were receiving "appropriate medical care and are in stable condition". The BBC's Zoe Conway reports.